There is no question that you need slow and intermittent demand products in an assortment to allow shoppers a choice of goods and the feeling your company can provide all the shopper will need. Customer POS basket analysis has repeatedly highlighted how slow demand products are bought with mainstay products increasing the sales gross margin. The real issue is how are you managing your slow demand product assortments? Do you even have a strategy for buying and replenishing your slow demand products or worse maybe your strategy is to manage empty shelf space by moving product around? The truth is when managed with a good strategy, slow demand products will make a significant contribution to your GMROI, providing a huge lift to company sales and image. Slow-moving inventory can be a boon if you have a smart stocking strategy. There are two key pieces that must work together for a retailer to win with slow movers: a replenishment system that provides strong forecasting and planning and an inventory policy that looks at inventory costs in conjunction with the GMROI profit contributions of each item. The results of your smart buying are higher sales, lower inventory and happy customers. A key action for you is to develop a strategy to improving the performance of your slow moving inventory. To become a master inventory strategist, you first need to define what is considered slow moving in your particular business, then you’ll need to understand the impact that segment of your inventory has on your business’s results. Let’s start by turning your attention to an article published in SCDigest which illustrates the importance of managing your slow moving SKUs. 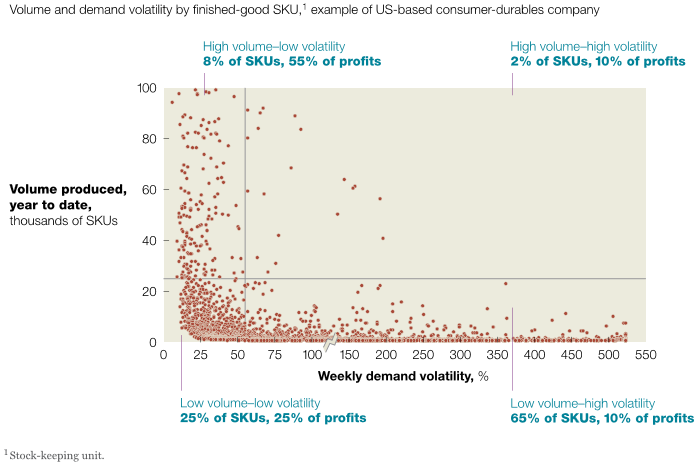 They used data from McKinsey Quarterly for segmenting the inventory by demand and volume. From there they could determine each segment’s profit contribution. The graph confirms what you know from experience: a significant portion of the inventory represented low-volume. However, those items were found to contribute 35% of the total profit – not an insignificant amount! With this sort of insight at your fingertips, you can construct a segmented supply chain strategy that fits your particular business needs to maximize your profitability. Think about all the insight you can gain into your inventory’s performance! Utilize demand forecasting that correctly identifies slow and intermittent demand. Demand should not smoothed or Zero Sales ignored when calculating a demand forecast. Your inventory plan should be integrated into your replenishment solution, consistently weighing your service level and inventory goals for each item, every day, to get the best results. Ready to become a master strategist of your inventory? Matching inventory to meet customer demand and sales results is what’s important. Do you have more questions that need to be answered? We can help you to ‘Tighten the Links in Your Chain™.’ We’re standing by ready to help when you’re ready. Just contact us., for solutions when you’re ready to take command of your slow demand.